It must be Christmas! 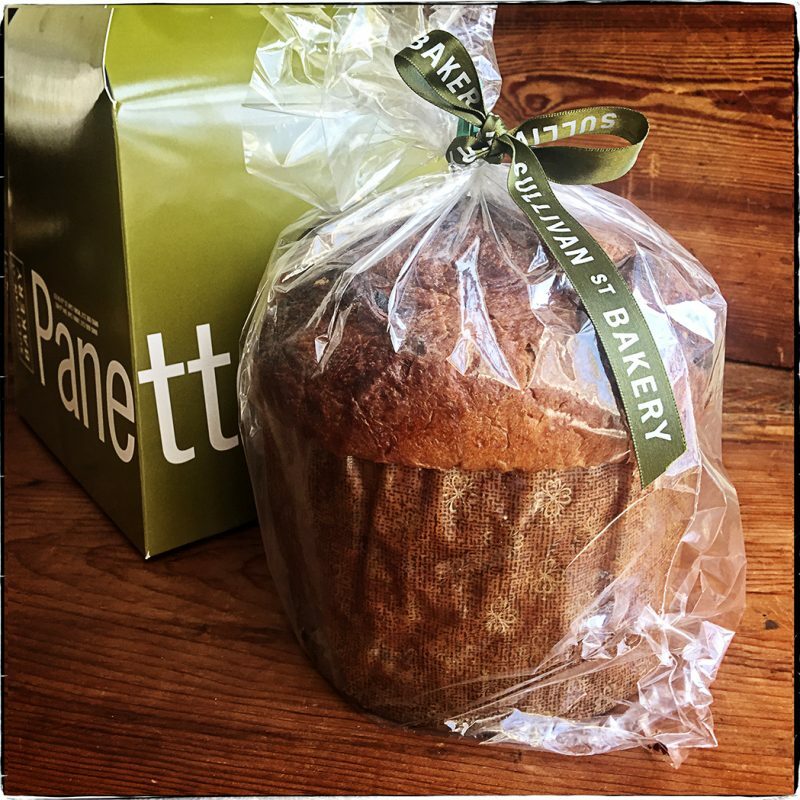 A beautiful panettone arrived in the mail today from NYC’s Sullivan Street Bakery. What a lovely gift. Anything that comes from Jim Lahey’s bakery is top of the ticket and this is a holiday special. We went downstairs to Early Bird Express for hot milky coffee, sliced into the tall tender, bread and sipped, dunked, and savored every bite. We have to evenly split what’s left of the loaf and not fight over who got the larger half! Buttered toasted panettone in the morning will be a great way to start tomorrow. How to make it last? If you want to order some click here https://www.foodydirect.com/restaurants/sullivan-street-bakery/dishes they are shipping until Monday, December 19th. Let the festivities begin. 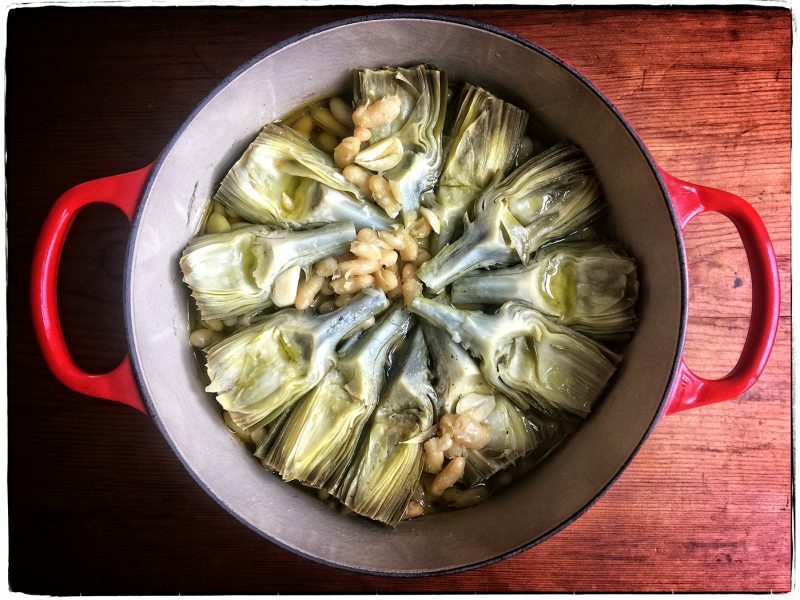 Starting off the week right—artichokes and cannellini. We have a ham bone in the fridge, so we’ll throw it in and have pork n’ beans for lunch. We had some mole poblano from our friend Nacxi Gaxiola of xillinyc.com stashed in our freezer. Rich and complex, it’s the perfect thing to have on hand. 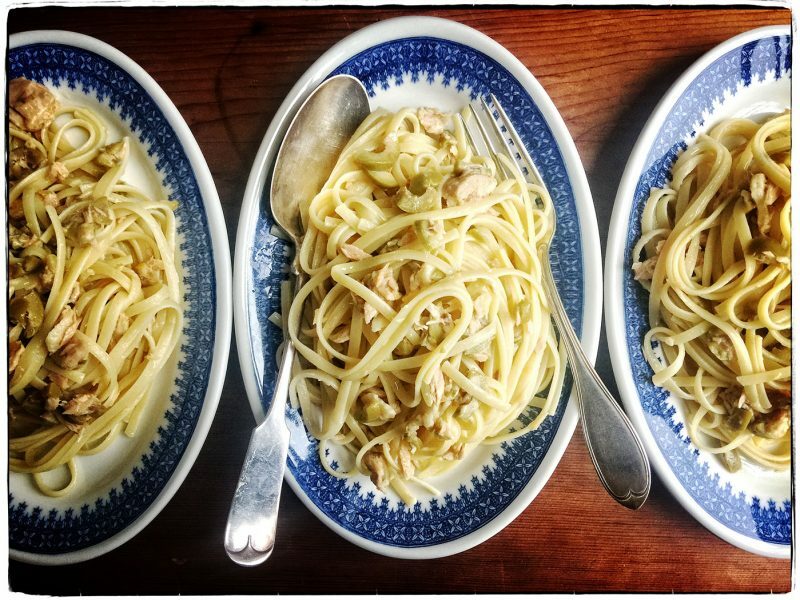 It transforms the simple into the sublime, as it did for our lunch today. 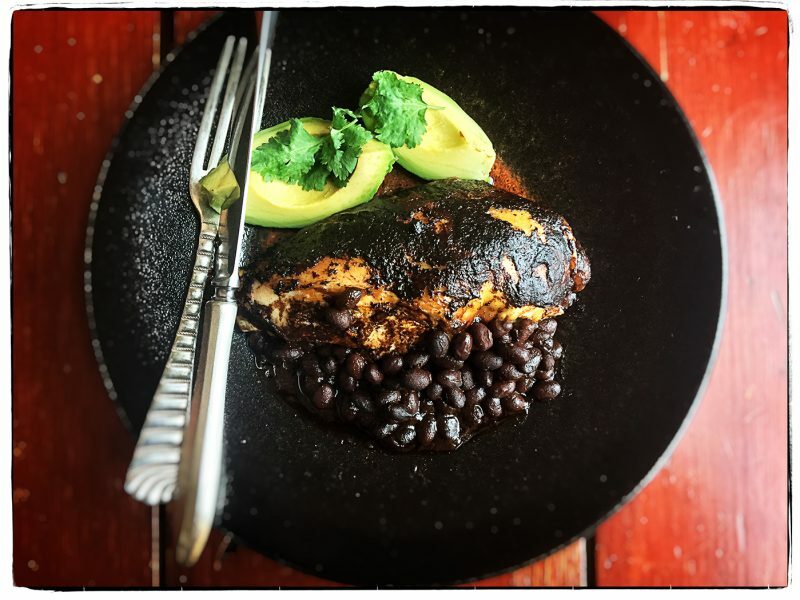 Pot-roasted chicken with mole poblano, black beans, and slices of avocado. We’ll have to replenish our stash of this “king” of sauces. It’s too good live without. This weekend one of us made a vat of ragù—sauce or gravy as it is called in nearby New York or Philly—which is a very good use of kitchen time. 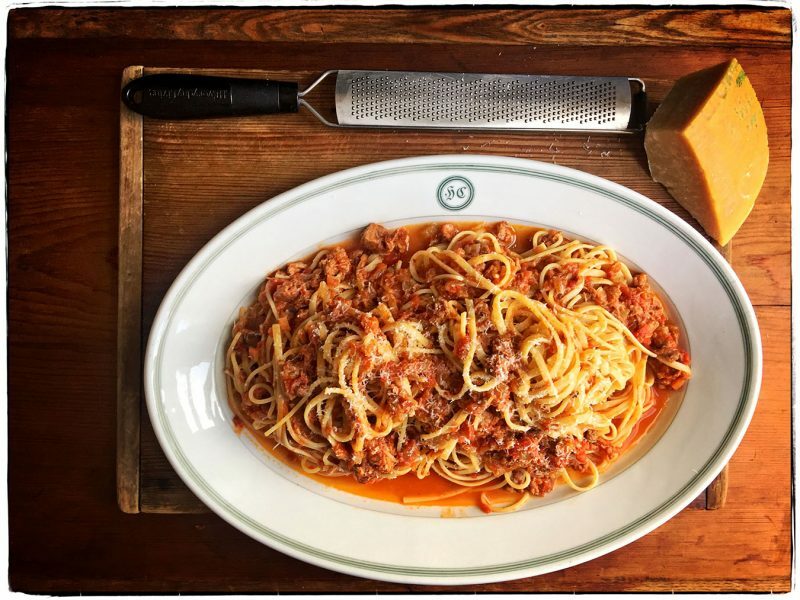 Short ribs, country ribs, hot and sweet Italian sausages simmered for hours flavoring the rich tomato sauce before they were scooped from the pot, the bones removed, the meat finely chopped, then returned to the pot. A container came to the studio today to share for lunch. But the cupboard was empty-ish and the sauce called! 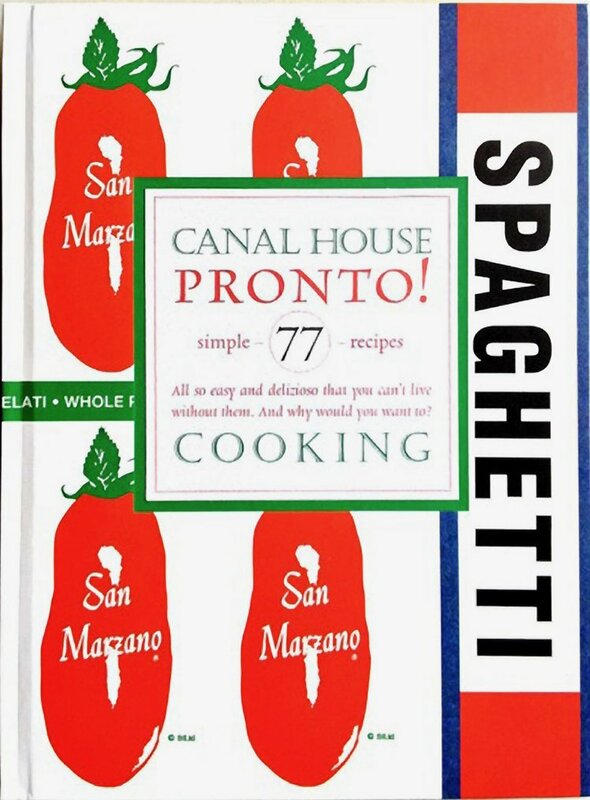 So we used what we had and plunged half a package of linguine into a pot of boiling water to be followed three minutes later by a small handful of thinner spaghetti. A sin to any self respecting Italian or Italian-American. It wasn’t correct, but it sure tasted divine. We had a dozen nice fresh eggs in the fridge, some corn tortillas, and a perfectly ripe, ready to eat Hass avocado. No trouble figuring out what we’d have for lunch today. 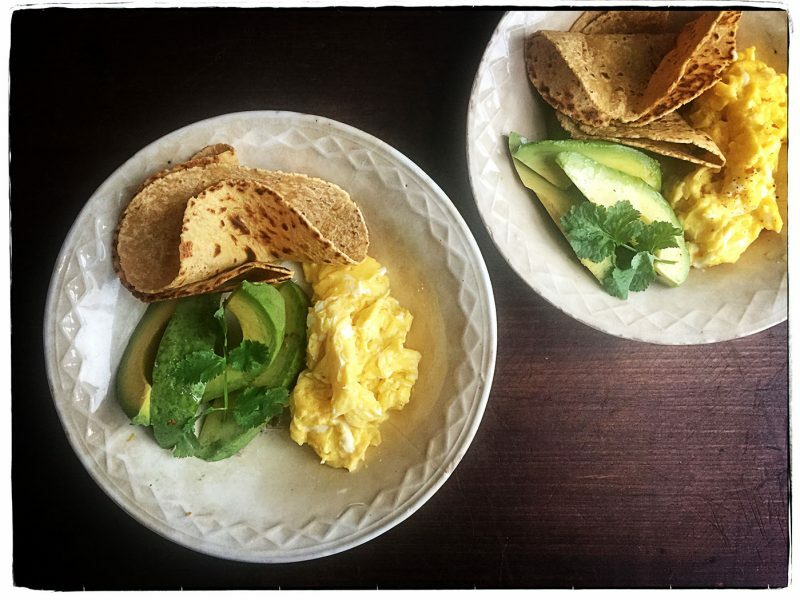 We warmed the tortillas in a cast-iron skillet, scrambled six eggs, sliced the avocado, then served everything together, seasoned with salt and chile flakes. Lunch, breakfast, or dinner, we could eat this combo any time of day. Remember to make something delicious for yourselves this weekend, dear friends.